This corn and green bean casserole feature shoepeg corn, but whole kernel corn may be substituted. It's a very easy side dish—perfect for a holiday menu or Sunday dinner. Condensed cream of celery soup is combined with sour cream to make the savory sauce. Crumbled Ritz cracker crumbs are tossed with butter for a delicious, crunchy topping. Lightly butter a 1 1/2-quart to 2-quart casserole or baking dish. Melt 2 tablespoons of butter in a skillet over medium-low heat. When the butter is hot, add the celery, onion, and bell pepper. Sauté until the onions are translucent and the vegetables are softened. In a large bowl, combine the condensed soup and sour cream; stir to blend thoroughly. Add the sauteed vegetable mixture along with the corn, and green beans. 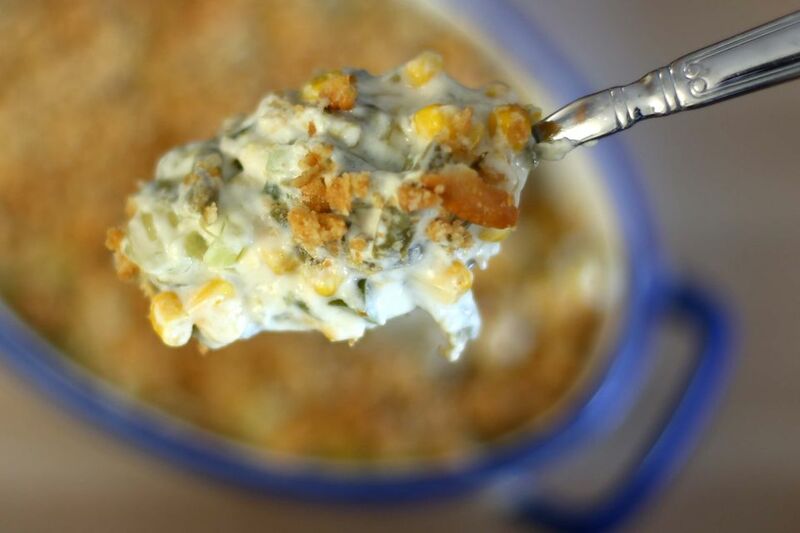 Melt the remaining 1 tablespoon of butter and toss with the Ritz cracker crumbs. Sprinkle the crumbs over the corn casserole. Bake the casserole in the preheated oven for 30 to 35 minutes, or until the filling is bubbly and the topping is lightly browned. Make It Ahead: Prepare the casserole filling a day in advance; pour it into the prepared casserole dish. Cover and refrigerate. Remove the casserole from the refrigerator about 25 minutes before you plan to bake it. Prepare the buttered cracker crumb topping; sprinkle the crumbs over the casserole and bake as directed. Replace the Ritz cracker crumbs with about 1 cup of soft bread crumbs or panko crumbs tossed with 2 tablespoons of melted butter. Replace the Ritz crackers with butter crackers or saltines. Canned drained butter beans may be used to replace the green beans.